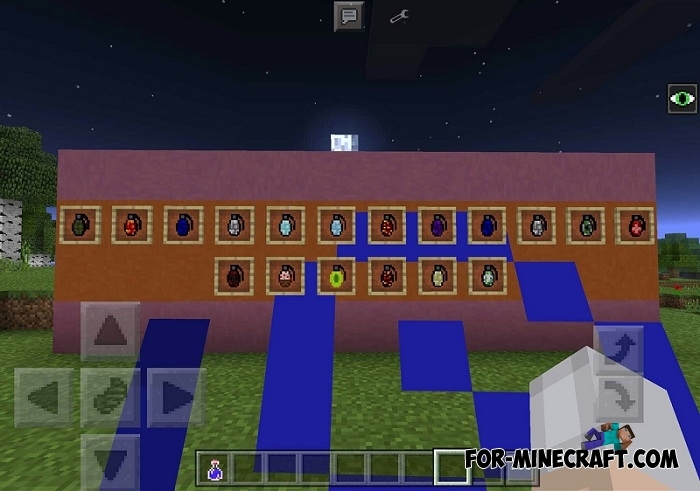 More grenades mod is small mod for Minecraft PE which adds 17 types of grenades in MCPE 1.0. Given the fact that Minecraft PE add-ons are not particularly interesting, and have few opportunities, I created this mod. Below you can read a small description about each type. 1. Standard grenade is the usual grenade with a small explosion radius, sometimes burning blocks. 2. Incendiary grenade ignites mobs and blocks within range. 3. Lava grenade works as the previous one but also throws out a lot of lava. 5/6. Snow & Ice is similar grenades but having a different strength. Snow grenade has the ability to greatly slow down the mobs, while the ice one completely stops the enemy. It is better to use the grenades from a distance. 7. Teleportation grenade moves mobs in the set point in the range of the grenade. To set the position you need to sit down and tap on any block. Mob will be teleported to that point. 8.. Water grenade causes a lot of damage, and then spews water. 9. Air grenade much throws up mobs in range. 10/11. Damage / Heals grenade restores / damages all mobs in range! Be careful! You will die (the chance is 93%) if you will stay close! 12. Cake grenade is a fun grenade replaces blocks on cakes within range! 13. Experience grenade drops experience orbs at the scene of the explosion (lots of experience!). You need a bottle o' enchanting for crafting. 14. Meteor grenade is very dangerous, it destroys the blocks! It spawns a meteorite to an explosion point, then there is an explosion, burning everything around! 15. Toxic grenade spawns a small cloud. This cloud will poison all living creatures during 5-6 sec. 16. Sand grenade spawns sand blocks on mobs heads. 17. Gravity grenade. It spawns dynamite (at the moment) which attracts mobs and detonates in range. The average radius of the explosion ≈ 3 - 3,5 blocks. All the grenades have a certain texture and the name, take them from the creative inventory. To install the More grenades mod, use the latest version of BlockLauncher.